If you adjust the formulas, let me know about your changes and results. The first formulation was developed for spraying. When dipped the thicker areas fired rough in texture, with pitting. The second formulation was developed to resolve the texture problem, and has not been vigorously tested. Also, the quantity of red iron oxide in our studio batches was often mixed in the 0.3 to 0.5 percent range, instead of one percent. The pot on the right has a thin spray on the outside and tenmoku on the inside. The body is a studio pug clay with red iron oxide added. 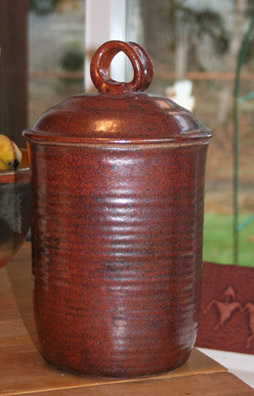 Glaze sprayed over red iron oxide spray on white stoneware. Thick application is white, thinnest application is near the base. Richest brown areas have more iron spray. 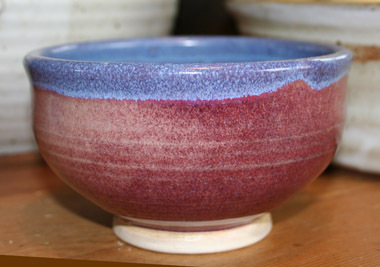 I reformulated this glaze for cone 7 firing. 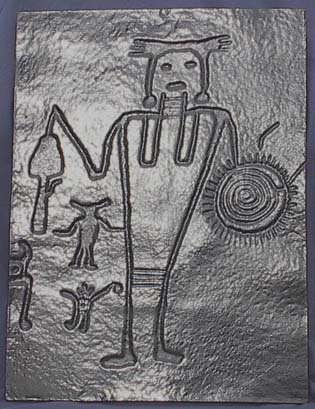 More example pieces on Pottery V page. 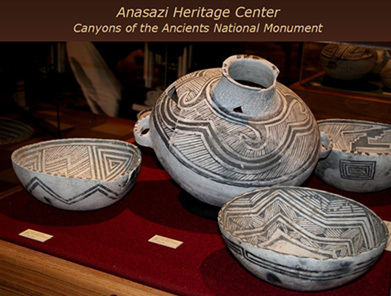 This glaze is an attempt to create a high fire glaze that looks like burnished Puebloan earthenware. I do not recommend this formula for food ware. Blue Hawaii on porcelain. This glaze is very stable, and can be applied thick. Will blush lavender with good reduction at cone 7. See also bowl atop this page. The bottle on the right is coated with a thin spray of Majolica. The glaze was wiped off the design portion, to provide contrast, before a thin coat of glaze was added. Applied thick this is an opaque, white glaze. I find it to be particularly suitable for dinnerware, such as the insides of mugs. It also combines well with Noxema. The clay used for the bottle is a studio pug blend with added iron. 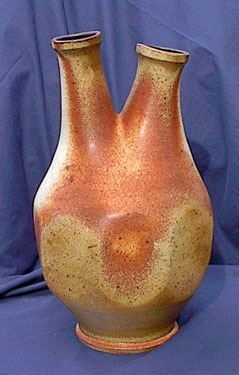 Speckling of several iron glazes also overlaid after spraying. 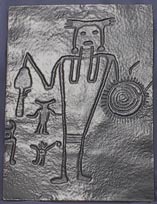 To read about how the bas relief design was created go to the Pottery I page. Start your reduction at cone 04 and stay in reduction for the entire firing. 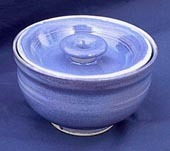 This bowl was thrown with Gary's white porcelain. The rim is double glazed. The interior is coated with a thin spray of Noxema Blue. The exterior has a thin spray coat of Stony White. I have only tested this formula as a light spray, after adjusting the formula from cone 10. It looked good on small test tiles, but be careful.